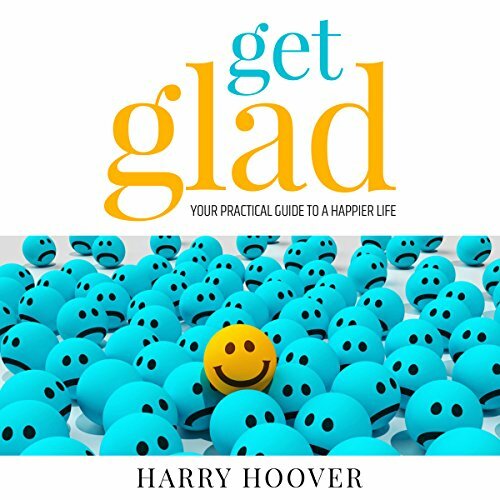 Getting happier is easy with Get Glad: Your Practical Guide to a Happier Life. This personal development book leads you through scientifically proven ways to become a little bit happier day-by-day. Author Harry Hoover says, "My purpose in life is to help others on their self-improvement journey. I believe that all people should have some measure of happiness in their lives, so I wrote Get Glad to show listeners how to get happier." Download Get Glad and start getting happier now! You've probably listened to other self-help books whose programs were too difficult to implement. Get Glad is so simple and effective, it should be one of the seven secrets of highly effective people. This life-changing, motivational book will help you in your personal growth. Come with us on this simple, practical step-by-step journey down the road toward happiness. ©2016 Harry W. Hoover Jr. (P)2016 Harry W. Hoover Jr.
Happiness made practical. Thank you, Mr. Hoover, for this lovely and useful guide and thoughtful reminder. Content Excellent- Some Technical Issues. Good and fun ideas to promote a happy spirit. I have already engaged my staff in one of the ideas for showing gratitude. This is a short book.It gives some good rules to getting happy. Harry Hoover is a fine narrator.The only issue is that some sentences are repeated.I was given this book free by the author,narrator or publisher. Would you listen to Get Glad again? Why? Yes, very well presented and simple guide to leading a happier existence. Simple roadmap to being happier with helpful personal insight. What insight do you think you’ll apply from Get Glad? The personal checklist that we far too often don't take the time to reflect on and record. Some interesting discussion of what makes each of us happy and how to find your own happiness. As I said, simple on the surface, but pretty deep thinking to utilize the framework that he outlines. The author shares his own life experiences on how life is not always perfect, nor do things have to go your way to "Get Glad"! He takes techniques that have been said by philosophers, religion, and everyday people on the finding happiness, consolidates them, and guides you on how you can also achieve happiness. PS You also learn a little about wine!